The RP Photonics Buyer's Guide contains 11 suppliers for fiber simulation software. Many aspects of the operation of passive and active fiber-optic devices are relatively complex. Therefore, numerical tools are required for analyzing various physical details. The resulting understanding can be used for the optimization both of the design of fiber components and of their use. In the following, an overview on different aspects is given which are often relevant for the development of active and passive fiber devices. The complexity and computation time of a mode solver depends critically on the type of index profile. Most all-glass fibers have a radially symmetric refractive index profile and also exhibit only weak index contrasts, so that approximations for weakly guiding waveguides can be used. Under these circumstances, the LP modes of the fiber can be calculated with a mode solver based on relatively simple numerical methods. This also means that the calculation can be rather fast – the complete guided mode properties can be calculated within a second on an ordinary PC, even if there are many such modes. Figure 1 shows an example for a few-mode fiber, where the wavelength is varied. While for the shortest wavelength (750 nm) the fiber has modes with 6 different intensity profiles, more and more modes disappear for longer wavelengths, until the fiber is single-mode. Figure 1: Amplitude profiles of all guided fiber modes for a variable wavelength. The diagram has been made with the software RP Fiber Power. Mode solvers based on substantially more sophisticated algorithms are required for other cases, such as polarization-maintaining fibers lacking radial symmetry, and in particular for photonic crystal fibers. The latter also exhibit very strong index contrasts, i.e., the weakly guiding approximation can not be applied. There are various numerical techniques, and generally the computation time is much longer than for the simple methods as normally used for all-glass fibers. Not in all situations, the calculation of fiber modes is both feasible and helpful. For example, the mode calculation is very difficult and rather time-consuming for the pump claddings of some double-clad fibers with irregular profile. It also gives more detailed information than required (hundreds or thousands of detailed mode intensity profiles), while still not fully taking into account the effects of irregular fiber bends. Another example is the behavior of fused fiber couplers, where the modes strongly depend on the local conditions. In such cases, it is often more suitable to numerical simulate the beam propagation. As a first example, Figure 2 shows how pump light gets absorbed in a double-clad fiber with a simple geometry: a circular core in the middle of a circular pump cladding. Here, pump absorption is quite incomplete as some modes have very poor overlap with the doped core. Such a beam propagation model can be easily applied to other geometries, e.g. with an off-centered core, a D-shaped or octagonal core, or with strong bending, which may even be variable along the fiber length. 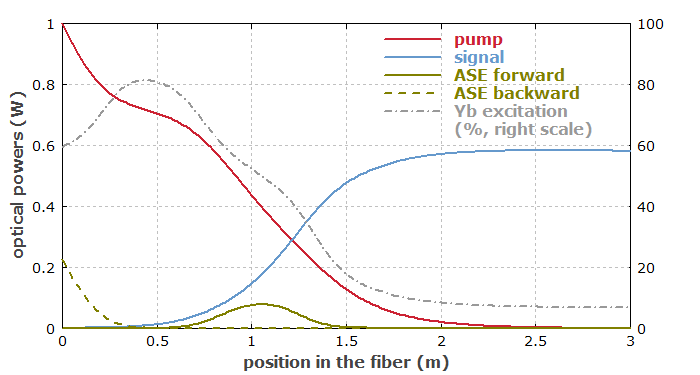 Figure 2: Amplitude distribution of pump light along a double-clad fiber with a circular pump cladding. This numerical simulation, done with the software RP Fiber Power, shows that the pump intensity distribution develops a “hole” in the core region. The remaining pump light exhibits quite incomplete absorption. Another example is a fused fiber coupler, where two cores come close together over some distance. Their evanescent fields then touch each other, so that light can couple over. The detailed behavior depends strongly on the gap size, the coupling distance, and the wavelength. Figure 3 shows a typical simulation. Figure 3: Amplitude distribution in the fiber coupler, simulated with the software RP Fiber Power. Optical amplification occurs in fiber lasers and amplifiers, which are usually based on rare-earth-doped fibers. The dopant is usually restricted to the fiber core, but there are also modified designs for special applications e.g. with ring doping around the core. Simple gain models are sufficient for many cases, but more sophisticated models are required in other situations. The interaction of the laser-active ions with the light field can usually be described with rate equation modeling. Differential equations describe the temporal evolution of the excitations of different levels for given optical intensities, and can also be used for calculating steady-state level populations. In many cases (e.g., ytterbium-doped lasers and amplifiers), a simplified gain model, considering only a single metastable state and the ground state, is sufficient for an accurate description. In other cases, however, a more sophisticated gain model needs to be set up, which may take into account multiple metastable levels and various processes which can shuffle ions between the different levels. For example, there can be excited-state absorption, quenching by upconversion processes or energy transfers, possibly even between different types of ions (e.g. in Er/Yb-doped fibers). Ideally, a software allows the user to define arbitrary level schemes and all the relevant processes. Various spectroscopic data are required for such modeling: effective transition cross sections (for ground-state absorption, excited-state absorption, emission), upper-state lifetimes, quenching or upconversion parameters, etc. On the other hand, a computer model can be an essential tool for extracting such data from results of measurements. The laser gain in a fiber also depends on mode properties. The resulting laser gain depends on the excitation density of the laser-active ions, but also on the overlap of the fiber modes with the dopant. Therefore, the gain does not only depend on the wavelength, but can also be different for different modes. Fiber designs can be optimized such that higher-order modes experience a lower gain than the favored fundamental mode. Self-consistent steady-state solutions are sometimes very hard to find efficiently. A reliable and efficient algorithm is not easy to develop. For calculating the steady state of a fiber laser, but also of a fiber amplifier with counterpropagating pump and signal, one needs to find a self-consistent solution for both the excitation densities and the optical powers. These quantities depend on each other, and neither one is originally known. While relatively simple methods such as the shooting method can be used in simple cases, the task becomes numerically quite demanding in more complicated cases, e.g. when there is also strong amplified spontaneous emission (ASE). Non-optimized algorithms can have serious problems with convergence and computation time when applied to difficult cases. As an example, Figure 4 shows the optical powers and the excitation density in an ytterbium-doped fiber amplifier. Although this example is relatively simple, the behavior of the device would be hard to predict without numerical simulations, as substantial saturation effects from ASE arise, and the distribution of ASE powers depends in complicated ways on the ytterbium excitation profile. Figure 4: Optical powers and excitation density along the fiber of an ytterbium-doped fiber amplifier, pumped at 940 nm. The simulation has been done with the software RP Fiber Power. In various cases, not the steady state is of interest, but rather the temporal evolution for time-dependent power inputs. As an example, one may consider a fiber amplifier which is first pumped for some time, so that some energy is stored in the fiber, and then serves to amplify an injected nanosecond pulse. During the pumping phase, the gain raises while the pump absorption decreases; the transmitted residual pump power may increase with time. When the signal pulse is injected, it will saturate the gain, so that the temporal shape of the output pulse can become quite distorted. 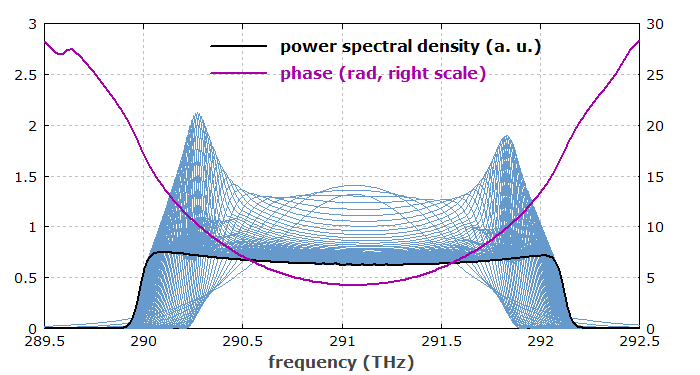 Figure 5 shows an example, where a signal input pulse with super-Gaussian temporal shape extracts much of the energy stored in an ytterbium-doped amplifier. The dot-dashed curve shows how the output would evolve without gain saturation. Due to gain saturation, however, the gain drops during the amplification, and the output power gets lower. Figure 5: Output power and ytterbium excitation versus time in a pulsed fiber amplifier. The diagram has been made with the software RP Fiber Power. Propagation times of pulses are relevant in some cases – for example, in Q-switched fiber lasers. Another example is a Q-switched fiber laser. Here, it is essential to take into account propagation times (which can often be neglected in amplifier models). Lasing begins with ASE, which can be spatially quite variable due to the high gain which fiber devices typically have. 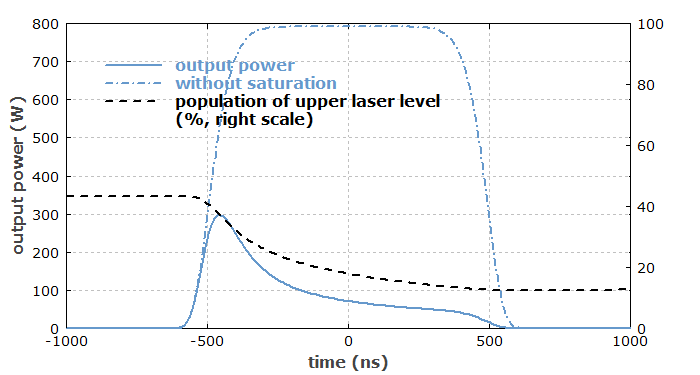 As a result, the generated output can exhibit complicated peak structures, which are not observed for Q-switched bulk lasers. Figure 6 shows an example case, where a very fast Q-switch has been assumed. For slower switching, one can obtain quite different pulse shapes. 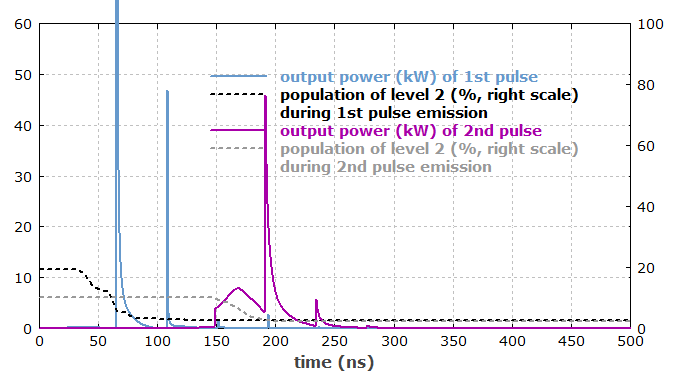 Figure 6: Output power and ytterbium excitation versus time in an actively Q-switched fiber laser, simulated with the RP Fiber Power software. Note that rather different time scales can be involved in a simulation. Pumping can usually be simulated with rather course numerical time steps, whereas the generation of a Q-switched pulse requires much finer steps. A software which can work only with a fixed step size would then be extremely time-consuming. Single-pass pulse propagation is not sufficient for many applications – one also needs multiple round trips, influences of other components, flexible inspection options, export of pulse details, etc. As an example, Figure 7 shows how the optical spectrum of the output pulse of a similariton-type mode-locked fiber laser converges to a nearly rectangular shape within 100 resonator round-trips. One also obtains the spectral phase, which is close to parabolic in the relevant region, so that dispersive pulse compression is not difficult to do. 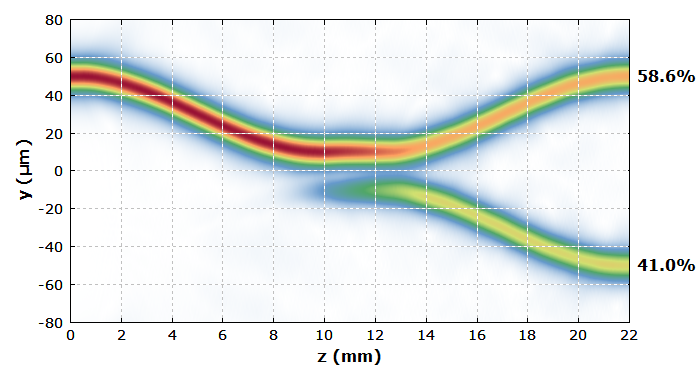 Figure 7: Pulses from a similariton-type mode-locked fiber laser for the first 100 round trips in the frequency domain. 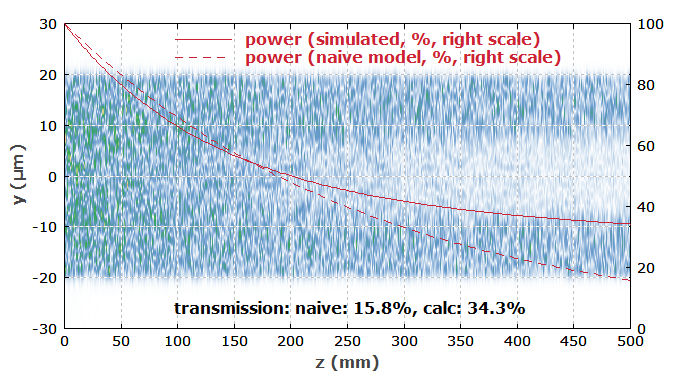 Generally, ultrashort pulse propagation is substantially more time-consuming to simulate, compared with simple propagation of powers for continuous-wave cases. For finding the steady state e.g. for the amplification of high-repetition rate pulse trains, it is therefore much more efficient to first do a steady-state calculation and then refine the solution as required with ultrashort pulse propagation. As the resulting processes can be rather complex, it is very desirable to have flexible tools both for arranging different model situations and for inspecting the results. For example, it is useful to inspect the pulses at any location and after any number of round trips in the time and frequency domain, and to store pulses at specified locations for later analysis. RP Fiber Power simulation software for designing fiber devices: fiber amplifiers, fiber lasers, ASE sources, fiber-optic data links, and passive devices such as multi-core fibers, tapered fibers and fiber couplers. 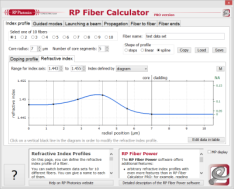 For simpler purposes, there is the free fiber optics software RP Fiber Calculator.